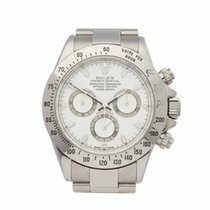 This is a pre-owned Rolex Daytona gents 6265 watch. 37mm case size in stainless steel, silver baton dial on a stainless steel oyster bracelet, powered by a mechanical wind movement. 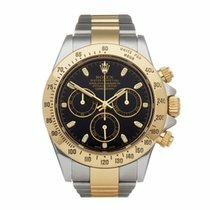 This Rolex is in excellent condition complete with box only. Circa 1975. Our Xupes reference is COM1812 should you need to quote this. 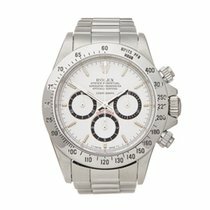 The hand wound Daytona models have become some of the most coveted Rolex sport watches for collectors. Yet among the references with the screw-down pushers this model, the reference 6265, is one of the most understated, due not least to its relatively modest 37mm size. This true vintage 6265 has been worn but well cared for (a number of watchmakers’ service markings attest to this). The brushed silver dial shows a light, mellow patina without noticeable faults or blemishes. The lume plots on the dial are full, excepting the one at three o’clock, which is partially worn (not untypical on Daytona dials). The lume on the handset matches. The case looks to have been only lightly polished at some point and there are some minor scuffs to the bezel, just what you’d want a watch to show after a few decades’ wear. The movement is super clean with the chronograph functions starting, stopping, and resetting correctly. The pushers may be service replacements. The 19mm, Rolex 73850 bracelet with 557 end links, is likewise in great condition and shows only minor signs of stretch and a few light scuffs from wear. In short, an honest example of this very desirable reference.